Throwing a brunch is one of our favorite ways to entertain in a more relaxed way. Throwing a brunch in the garden, well, that puts me in my happy place! A year ago Prince Charming dropped the hint he’d really love to try these corn waffles with warm lobster salad from Boston restaurateur Jeremy Sewall. Corn season had already passed so I filed the recipe and I waited until fresh corn and lobster were in season again to try it. It was the star of a recent summer brunch menu where it won rave reviews. It is a quintessential summer dish. The waffles, chock full of freshly shucked corn, were outstanding. Topped with lobster salad? Out of this world! Thick, fluffy and with a terrific texture, these waffles were the best I ever tasted. I added pancetta and Old Bay seasoning to the original lobster salad recipe and more herbs to the crème fraîche. The lobster salad comes together in minutes and was a fresh, light addition to a more traditional waffle meal. Melt the butter in a large sauté pan over medium high heat. Add the shallots, corn and pancetta to the pan and cook 1 minute. Add the leeks and lobster and cook another minute. Remove from heat and add lemon zest, lemon juice, Old Bay seasoning and basil leaves. In a large bowl, combine flour, cornmeal,sugar, baking powder and salt. In another bowl, whisk together the eggs, add the butter, water and corn. Add to the flour mixture until just combined. Bake waffles on a waffle iron or griddle until golden. I chose to make round waffles, dividing the batter in 10 portions. You could make one large square waffle per person instead and cut it 4 wedges as Chef Sewall recommends. Mix all ingredients together. Drizzle over the lobster salad once, plated. On top of each waffle, place some lobster salad. Drizzle with some herbed crème fraîche. Serve immediately. If making this for a crowd, having 2 or 3 waffle irons going at once would make the processing more efficient. 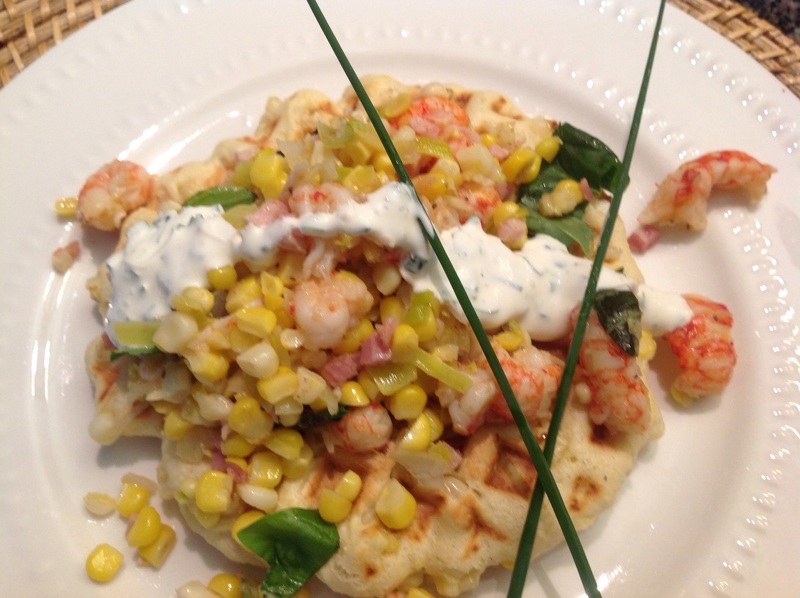 This entry was posted in Entertaining, Gardening, Recipes and tagged corn waffles with lobster, fresh corn waffles with lobster salad, Summer brunch menu by Johanne Lamarche. Bookmark the permalink. Wow! What a great summer brunch idea! Did you boil your own lobsters or buy the meat pre- cooked somewhere? Thanks Lynne! Bought the lobster already steamed and ready to eat. Seafood USA and Costco has it. Wow!! This is really lovely. Beautiful fresh corn, creme fraiche, pancetta- and of course the lobster! 🙂 Love that you can get the lobster at Costco- even more amazing! Loved that Costoco had it too! This was such a fun brunch switch up. Thanks Josette. Thanks Jhuls. It is a great summer recipe. Have a good week as well. Our home will be filled with the joyous sounds of little ones visiting! I love the idea of brunch too but never plan one! I so wish we had access to fresh lobster. That is one of the biggest reasons I love visiting the Northeast. This recipe is amazing!!!! I love that you didn’t use mayonnaise. I’ll be making this one maybe for date night. Hi Julie! Your Mexican meatballs are filling the house with tantalizing aroma right now! An hour to go! I used frozen lobster from Costco. If you have a Seafood USA near you, they sell lobster in season or frozen in vaccum packs. If for date night, divide the recipe in half. I loved that this did not have mayo in it too. I added the lemon juice to the crème fraîche when I wrote it up as I found I could not drizzle it nicely without. Enjoy! Thank you Johanne! I have a Costco that I can’t go a week without visiting. Lobster is on this weeks list! Lobster langoutines is what they call it. Oh please let me know how the meatballs turn out! No 24 servings here….these hungry sons devoured the first batch and begged for more. I am cooking up a second batch now! My peppers were already chopped so I wasn’t sure how much 3 would be so they were HOT, in a nice way. My hubby said a bit of lime crèma would be great on them. I put fewer peppers in this batch. I get the servings thing. Serves 6 is perfect for my husband n I. 🙂 Thank you Johanne, I always love talking to you! Thank you Angie. Glad you enjoyed the menu. I love brunch too!